Last summer we completed the renovation of our Brookland House project, with J.Allen Smith Design/Build as the General Contractor. It was a complex project. The age of the house and the fact that it was balloon framed presented some challenges, but all is well that ends well. We recently stopped by for a pre-shoot. A more comprehensive professional photo shoot will be done in the Spring once the landscaping phase is completed. 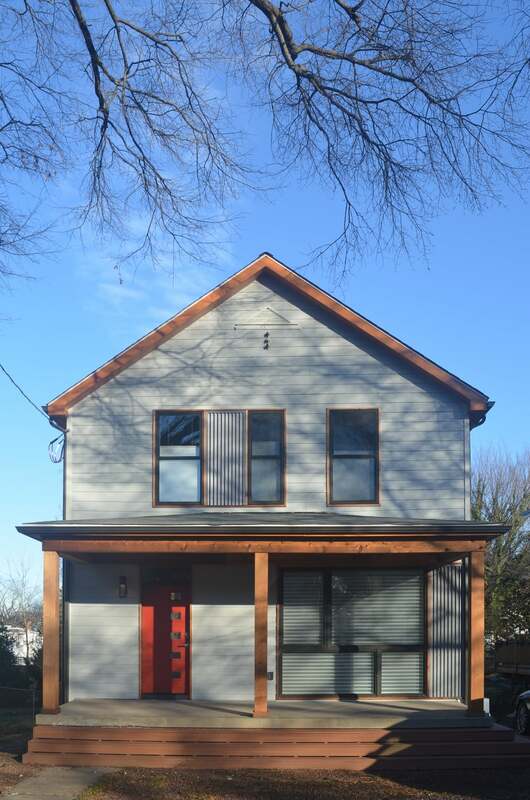 At the front of the house, windows, front door and siding were modified/replaced, the front porch was updated with cedar trim and wider steps. At the rear of the house a new kitchen/family room and master suite were added, to replace a 1950's addition. The footprint of the house did not change, however, which simplified the permitting process. A two foot wide unsafe stair was replaced with a centrally located stair that became the organizing element of the new house. An existing long front hall and compartmentalized spaces were transformed to an open plan through the removal of several load-bearing walls which we replaced with new flush beams. A retro kitchen was replaced with an efficient new kitchen opening onto the family room and new exterior deck (note the pantry under the stair landing). See more photos of the finished house, renderings and construction photos HERE!